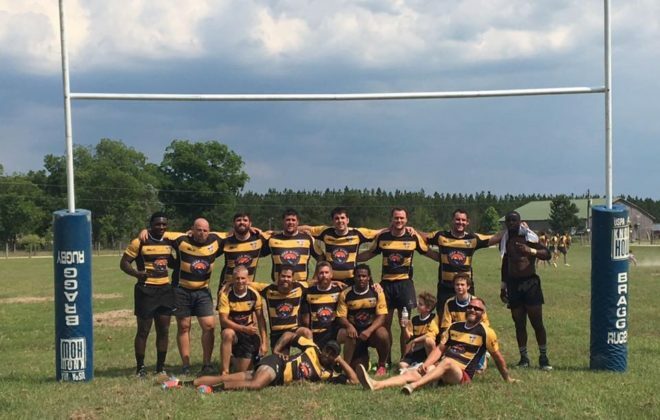 FAYETTEVILLE, NC – This past Saturday, the Clayton Bootleggers 7s team opened up their season with a Bowl Championship at the Airborne 7s hosted by Fort Bragg Rugby Club. The tournament got off to a rough start as the Bootleggers dropped their first two games of the tournament. However, they bounced back strong with three straight wins to claim the Bowl. While it wasn’t the hardware they were after, the squad showed improvement throughout the tournament which bodes well for the rest of the Summer. The Bootleggers opened up the tournament with eventual runner up Old Toe. The men fell 26-17, but pushed a solid opponent to the end. Kutztown University product Joseph Thatcher scored two tries and Matt Aronowitz added a try in the loss. Things didn’t get much better in the second match as the Bootleggers struggled to maintain shape in a 40-7 loss to Fort Bragg A. Thatcher scored the lone try in the match and added the conversion. With two losses in hand, the Bootleggers were back into a corner and faced off against a dangerous Camp Lejeune side. The men from Clayton put together a strong effort coming away with a 24-0 win. Notre Dame College product Flapp Bradshaw scored a try and added a conversion, Brendan Fitzpatrick scored a try with conversion, and the the Crumity Brothers… Chris and Anthony each scored a try for the Bootleggers in their shutout victory. Having missed out on the Cup round, the Bootleggers moved into the Bowl Semifinals where they faced off against Fort Bragg B. The two sides got into a slugfest, but it was Clayton who pulled away down the stretch with a 33-19 win. Nick Russell, Aronowitz, Thatcher, Bradshaw, and Anthony Crumity each scored for the Bootleggers in the match. The win pushed Clayton into the Bowl Final and a rematch with Camp Lejeune. Just as in their first meeting of the day, the Bootleggers dictated the pace of play and scored a 35-14 win. Thatcher added his 5th try of the tournament, Russell scored his second, Bradshaw added his third of the day, and Wes Smith scored his first of the tournament with Fitzpatrick adding the conversions. The Bootleggers 7s side aims to keep the momentum going as they prepare for the Moonshine 7s hosted by the Raleigh Rugby Club on June 17th. The squad practices every Wednesday night, 7pm, at East Clayton Community Park. New players are welcome at any time during the season.